MM: Thanks so much for doing this interview with us, Carolyn. Let’s start with a little background info. Where do you live and work? How do you like to spend your time? CY: Thank you for asking. I live in Macon, Georgia. They tell me it’s the middle of Georgia, but because Georgia is not a rectangular state, how do we decide where the middle is? I’m an associate professor in the math department at Mercer University. I really like math and thinking a lot. I also like to make things with my hands, especially using yarn. So I like to crochet, knit, tat, and make temari balls. But I also like to bake, garden, read, sew, and hang out with my dog and my spouse. MM: Sofia, Ana, and Anthony want to know how you got started making temari. What inspired you? CY: Actually, I went to the store to buy a crochet book that used diagrams rather than written instructions, because I thought it was a cool way of encoding the information. On the shelf nearby I saw the cover of The Temari Book by Anna Diamond. The picture on the cover is filled with beautiful temari balls, and I knew I had to learn how to make them, so I bought the book. CY: I’ve always been sort of fearless about teaching myself crafts from books. I started doing this when I was about eight or nine years old. I think that learning mathematics and learning crafts from books is a similar skill. Both involve reading every line over and over until it makes sense. In order to fully comprehend, one has to work alongside the text. Learning from mistakes is part of the process. Guessing the next step and trying it out is common. Backtracking is not a big deal. Finally, general metacognition is indispensable. CY: I like the symmetry of the temari balls. The intricacy of some of the patterns and the variety of patterns is amazing, especially if one considers the fact that every stitch is a straight line on the sphere. Some of these traits strike any observer, while others wouldn’t be as obvious until one became more aware of the art form. (Check out this stunning collection to see what I mean.) It wasn’t until I had made several temari balls that I realized that the guidelines of non-spindle balls were naturally marking both a platonic solid and its dual. In fact, further analysis showed this realization to be specific to my methods—even with these methods marking an octahedron would not necessarily mark a cube! 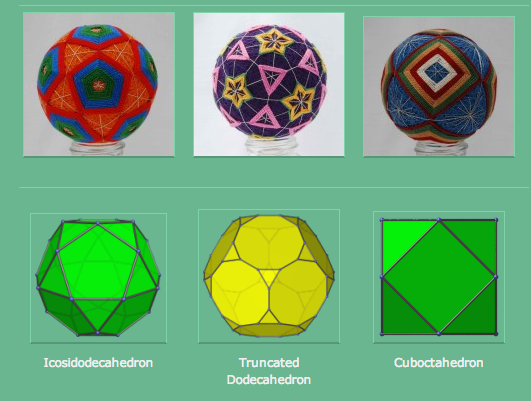 CY: If you want to start making temari balls, check out this fantastic, extremely comprehensive website. As far as I can tell, there are a number of schools of thought on how to make a temari ball. The most traditional involves wrapping rice hulls in a cloth and wrapping that in silk threads until you form it into a sphere. Then wrap the sphere with silk threads from old kimonos wrapping every which way to create your spherical embroidery base. I am not traditional, so I use a styrofoam ball core, sometimes I wrap it in acrylic yarn or other batting, and then I wrap that in cheap polyester serger thread, avoiding parallel wrapping threads, to create my spherical embroidery base. (Warning: Don’t use slippery wrapping thread, or it will all sag off of the spherical base, and you will be sad.) Then I use metallic thread to build guide lines for the stitching regions. How long it takes to make a temari ball depends on the design, especially on the number of stitches. The ones I have made have taken me between four and twenty hours. When I was a beginner, understanding the directions was the most time consuming part. Now the stitching is what takes me the longest. CY: Absolutely there are more solids to mimic! For one thing, there are fourteen different kinds of symmetry patterns for a sphere, and all fourteen can be done with temari. I demonstrated this in my chapter of Crafting by Concepts. The idea to investigate making the Archimedean solids was a later project for me. I only know how to make the Archimedeans that arise from truncation and duality. I don’t, however, know how to make the snub cube or snub dodecahedron. In fact, I have only made these three, but theoretically I know how to make all that arise from truncation. Other temari artists have surely made them, but some of the techniques are pretty advanced. The soccer ball question is very interesting. In some sense the answer is yes, because the vertices (corners) on the soccer ball all lie equidistant from the center. This means that soccer ball is a spherical solid, because the vertices lie on a sphere. Furthermore, the soccer ball is a truncated Platonic solid—the truncated icosahedron. On the other hand, the answer is no. When making a temari ball, one is trying to mark what would be straight line polyhedral edges if they were bent to lie on a sphere. This turns out to be a difficult problem. When making a soccer ball, one can just sew together flat pieces with straight edges in the appropriate arrangement. In that way, the problems are different. MM: What was math like for you as a kid? When did you first fall in love with math? CY: We had physical mathematical puzzles around the house as decorations. My parents are now retired professors of math and of math education, so they gave age appropriate math problems when asked. That made math fun and intriguing. I always got the right level of challenge and was required to give an explanation to support my responses. When I made up nonsense I was pointed to where the problems resided. MM: Was/is math ever especially hard for you? What’s a mathematician to do when things get hard? CY: Of course! I think that every mathematician works at the edge of his or her understanding. The point of learning and of research is to increase one’s understanding, which always means doing something you don’t know yet. That’s hard, but it’s also very creative and fun. I call it “playing math.”I think, though, that the question was slightly different—I think it was about whether I have experienced times when math was too hard. That has also happened to me. Sometimes instead of working right at the edge of one’s understanding, one is asked to work too far beyond the edge of one’s understanding. In those cases, it can be hard to relate the new material back to what one already knows. In that situation, I have tried to create or find examples to try to ground myself, talk to other mathematicians to get a variety of perspectives, work with other people to have support during the learning process, or if none of that works, step back and wait until later, when the boundary of my understanding has broadened. At that point, I often find that what was once incomprehensible later makes sense. MM: What can you tell us about your job as a college professor? Ryan asks “what classes do you teach?” What do you love about being a mathematician? CY: I teach at a liberal arts college inside of a comprehensive university. That means that I teach undergraduate mathematics. Within that set of courses, I teach a lot of calculus, some statistics, introduction to proofs, and whatever else I’m asked to teach, which has encompassed about fifteen different courses in all. My favorite class is abstract algebra, which is so beautiful to me. Words cannot express the sense of profound peace I find in the organization that algebra creates and describes. Being a professor is highly interesting and challenging, because every day is different. In some ways, I have a lot of control over what I do in that I can determine how I spend my time, what topics I research, and so forth. On the other hand, I have a huge variety of things to work on at all times from preparing for class, grading, and holding office hours to help students, to learning new mathematics, conducting research, and writing papers, to reviewing papers, to attending committee meetings and doing committee work, amongst other things. All of that work fills up much more than 40 hours a week. In fact, it could easily fill up all of my waking hours. There are so many fantastic aspects to my job that I have trouble narrowing them down. Essentially, I love helping people understand mathematics. I find it gratifying to help individuals discover what they like to do. I am also so enthusiastic about math that I enjoy telling people about why I find it so enchanting. Finally, I get to play math both by myself and with my math friends, and we call it research. MM: We write our blog so that young people will have a place to experience the wide world of mathematics. Do you have a message for young mathematicians? CY: Young people sometimes worry about falling behind in their learning. When their peers know a subject a year before them, it causes fits of anxiety. The secret is that you cannot fall behind in your own life. Everyone understands things in their own way and on their own timeline. In the long run, the only person who really cares about your progress rate is you. Besides that, the only person you can be is yourself, and that turns out to be a good thing. Your greatest possible contribution to the world, including the world of mathematics, is to think creatively and deeply in the way that only you can. Don’t try to be someone else. Just try to be your best self. I promise you can succeed. Ive learned a lot from reading this article! I understand a little more about circles and how to make a termari ball. Do Your students enjoy the crafting concepts of math as much as you do? Do these techniques help with Graphic design? My students have generally loved the make-y side of math. I totally think it would help with graphic design, but im not a professional designer. its a nice diagram, I thing it would be good for the graphic designer as well. GREAT JOB! What is the hardest math problem that you have simplified? How long have you been studying math? Are there more subjects that you like to learn?